Tax on trees was a tax imposed in USSR in 1944 on fruit trees. The tax made it expensive to have trees on a farm, and had the unintended consequence of causing a mass felling of trees by Soviet farmers. This subsequently led to shortage of fruit. 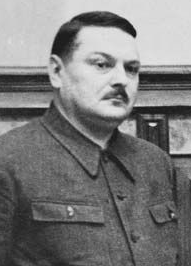 Arseny Grigoryevich Zverev was a Soviet Russian politician, economist and statesman whose career spanned the rules of Stalin and Khrushchev, but culminated during the Stalin years. Zverev was born in a little village just outside Moscow. After years in local politics, he rose to prominence as a Deputy Commissar of Finance, but he also held other lesser posts such as a member of the Supreme Soviet of the Soviet Union. Animal Farm is an allegorical novella by George Orwell, first published in England on 17 August 1945. According to Orwell, the fable reflects events leading up to the Russian Revolution of 1917 and then on into the Stalinist era of the Soviet Union. Orwell, a democratic socialist, was a critic of Joseph Stalin and hostile to Moscow-directed Stalinism, an attitude that was critically shaped by his experiences during the Spanish Civil War. The Soviet Union, he believed, had become a brutal dictatorship, built upon a cult of personality and enforced by a reign of terror. In a letter to Yvonne Davet, Orwell described Animal Farm as a satirical tale against Stalin, and in his essay "Why I Write" (1946), wrote that Animal Farm was the first book in which he tried, with full consciousness of what he was doing, "to fuse political purpose and artistic purpose into one whole". In political science, Marxism–Leninism was the official state ideology of the Soviet Union (USSR), the political parties of the Communist International, and of contemporary Stalinist political parties. Combining Leninist political praxis and Marxist socio-economics, the purpose of Marxism–Leninism is the two-stage revolutionary development of a capitalist state into a socialist state, guided by the leadership of a vanguard party of professional revolutionaries from the working class and the proletariat. The socialist state is instituted and governed by way of the dictatorship of the proletariat, which determines policy with democratic centralism. Lysenkoism was a political campaign conducted by Trofim Lysenko, his followers and Soviet authorities against genetics and science-based agriculture. Lysenko served as the director of the Soviet Union's Lenin All-Union Academy of Agricultural Sciences. Lysenkoism began in the late 1920s and formally ended in 1964. The Soviet government forced the collectivization of its agricultural sector between 1928 and 1940 during the ascendancy of Joseph Stalin. It began during and was part of the first five-year plan. 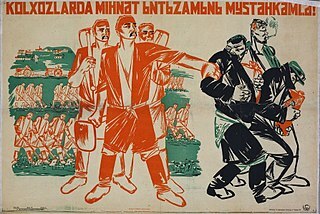 The policy aimed to consolidate individual landholdings and labour into collective farms: mainly kolkhozy and sovkhozy. The Soviet leadership confidently expected that the replacement of individual peasant farms by collective ones would immediately increase the food supply for the urban population, the supply of raw materials for processing industry, and agricultural exports. Planners regarded collectivization as the solution to the crisis of agricultural distribution that had developed from 1927. This problem became more acute as the Soviet Union pressed ahead with its ambitious industrialization program, meaning that more food needed to be produced to keep up with urban demand. The Soviet famine of 1932–33 was a major famine that killed millions of people in the major grain-producing areas of the Soviet Union, including Ukraine, Northern Caucasus, Volga Region and Kazakhstan, the South Urals, and West Siberia. The Holodomor in Ukraine and Kazakh famine of 1932–33 have been seen as genocide committed by Joseph Stalin's government ; it is estimated between 3.3 and 7.5 million died in Ukraine and ~2,000,000 died in Kazakhstan. The NEPmen were businesspeople in the young Soviet Union who took advantage of the opportunities for private trade and small-scale manufacturing provided under the New Economic Policy. The Famine of 1921-1922 epitomized the adverse effects of War Communism, and to remedy or mitigate such effects Vladimir Lenin took, what the communist party saw as, “a step backwards.” Lenin responded by instituting the NEP, which encouraged private buying and selling, even to, as one official (Bukharin) put it, "enrich yourselves". The biggest group of the 3 million or so NEPmen were engaged in handicrafts in the countryside, but it was those who traded or ran small businesses in the city that faced the most negative attitudes, since some amassed considerable fortunes. The New Course was an economic policy that aimed to improve the standard of living, increase the availability of consumer goods in East Germany, lower the price of foodstuffs, small businesses and farms would be returned to the private sector. The New Economic Policy was an economic policy of Soviet Russia proposed by Vladimir Lenin in 1921 as a temporary expedient. 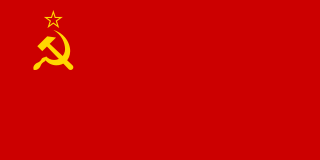 Lenin characterized the NEP in 1922 as an economic system that would include "a free market and capitalism, both subject to state control", while socialized state enterprises would operate on "a profit basis".